This blog is in response to my podcast with Ben Kelly. During this episode’s interview with Ben Kelly, he is jazzed about Minecraft as a tool that aligns with the Universal Design for Learning framework. I’m jazzed about his participation in action research. This research method is extremely powerful because it gives us answers about how we can change our instruction or environment to meet the needs of our learners. Ben and colleagues throughout New Brunswick, Canada took part in UDL-focused action research projects that were supported by the University of New Brunswick as well as the New Brunswick Department of Education. This powerful partnership led to the publication of each team’s findings. The teams investigated topics including: student engagement in project-based learning, eBook usage by English language learners, grade 9 math, engagement around a social studies curriculum, promoting student engagement, increasing engagement in an inclusive environment, establishing collaboration among teachers who are implanting UDL, using math exchanges and math stations to improve problem solving and numeracy skills, and using formative assessment to improve skill development, understanding, and self-correction in physical education. Their reported results are enlightening and supportive of the UDL framework! I promise that after you have read some or all of these articles, you will become jazzed about the possibilities action research bring to you! But if you have never learned about action research or it has been a while since you tried it out, where do you start? George Mason University has gathered quality resources including work done by the University of Maryland as part of a National Science Foundation (NSF) grant called Project Nexus. Linking very nicely to UDL, this project encouraged teachers to use the regular sources of interviews and written text but also included student drawings (a lovely connection to the principle of Action & Expression!). Maybe you are interested in giving action research a try, but you are not sure whether you want to conduct action research on your own, with a team, at the school level, or at the district level. In this document, written by Eileen Ferrance and published and distributed by Brown University, there is a wonderfully helpful table that guides the reader to understand the supports needed, the potential impact that the research can have, and potential side effects in relationship to individual teacher research, collaborative action research, school-wide action research, or district-wide action research. Ultimately, action research puts the power in your hands. As with any research, you decide what you want to study, how you want to structure the study, and who you want to have involved in your study, but action research is accessible to teachers. It relies on the assessment of what you are doing in your classroom and the work your students produce. 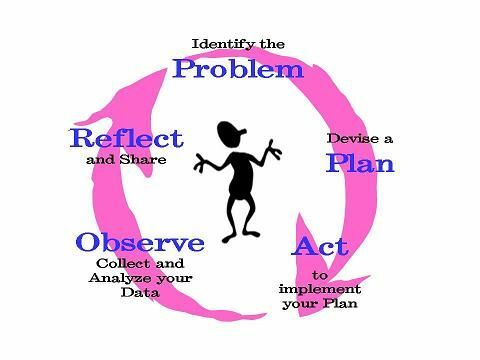 These are things you look at anyway; the action research process provides a more structured and in-depth way to investigate your question, set a strong plan, collect the data, analyze and interpret those data, reflect on your findings, and ultimately finish that loop of formative assessment by making informed changes and sharing what you have learned. After all, you could be like the teachers in New Brunswick, Canada and your lessons could empower a bunch of other teachers!